Ballymore kicks off a busy weekend with runners at the Sydney and Melbourne night meetings. At Moonee Valley we have two nice each-way chances in the shape of Suspicious Minds and Jemerica who contest the second and eighth races. To jump from the inside gate in the Five By The Best Handicap, Suspicious Minds is due a change of luck after finding some trouble at her last two starts. Prior to those runs an impressive winner at Kyneton, the Alamosa four-year-old has run a couple of handy races and Moonee Valley and Anthony Feroce noted that with Patrick Maloney aboard she should run well. "From a nice gate she looks a good each-way chance," he said. Racing in the Alternate Railway Handicap, Jemerica is another horse who has not had the best of luck of late but her latest fourth at Mornington was a run full of merit. "She has drawn an awkward gate (11)," Feroce conceded, "but she has enough gate speed to get across." "She strips fitter for recent racing and is also a good each-way hope." Meanwhile at Canterbury we have Murcielaga (pictured) taking his place in the third race, the Cellarbrations Handicap over 1550m with James McDonald to ride. Far from disgraced in a race not really run to suit at Sandown last time out, the Testa Rossa gelding is having his first taste of Sydney racing but he has been well prepared for it. 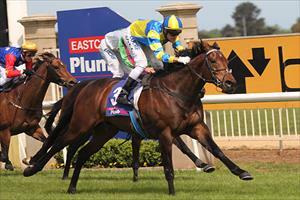 "He has worked around the other way here at Flemington and he went well," Feroce said. "He is suited up in distance and should run well - and if there happens to be any rain about tonight that would be even better."